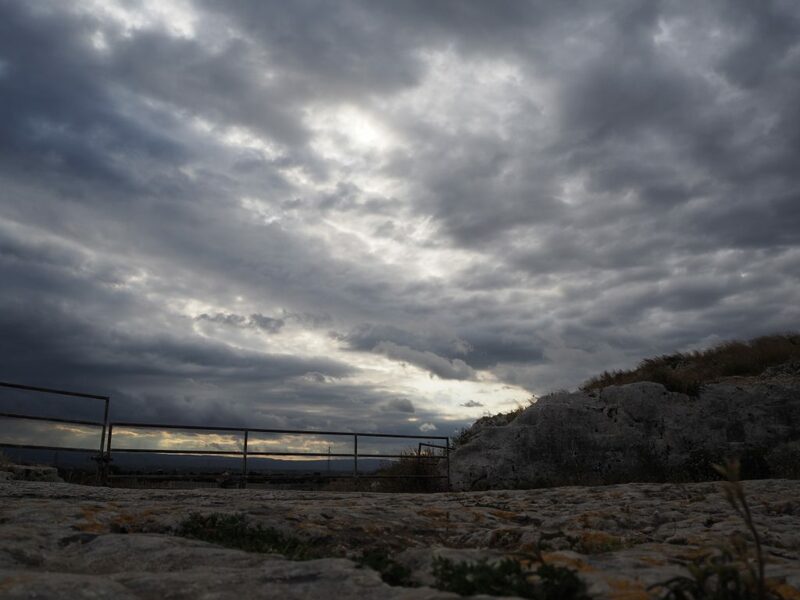 Visiting Syracuse’s archaeological park is a must do when in Sicily. 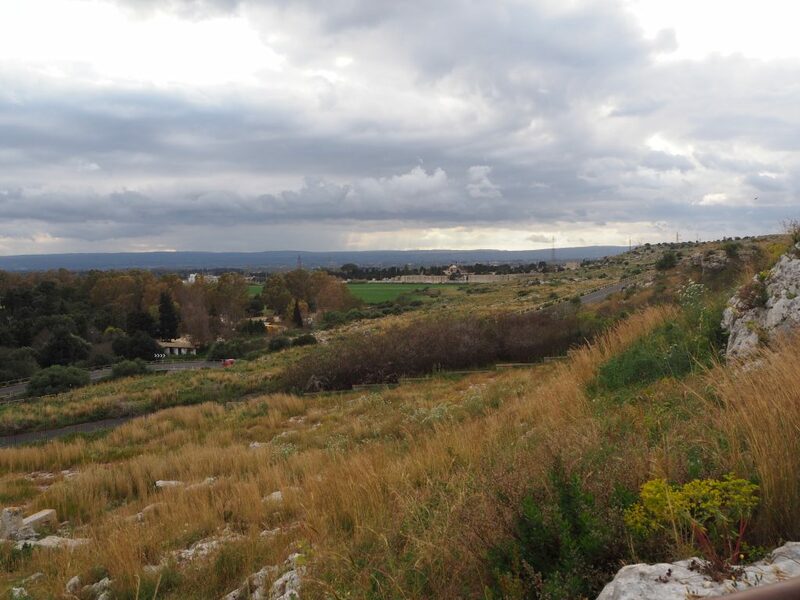 Just a five minute drive, or a half hour walk from the beautiful Ortygia lies Syracuse’s stunning ancient archaeological park and a visit here is well worth a few hours of your day. We visited in April when there were very few crowds and at times it felt as though we had the site all to ourselves. I imagine in the height of tourist season it is much busier, but don’t let that put you off. There are plenty of places to hide from the crowds and get lost in a little history. 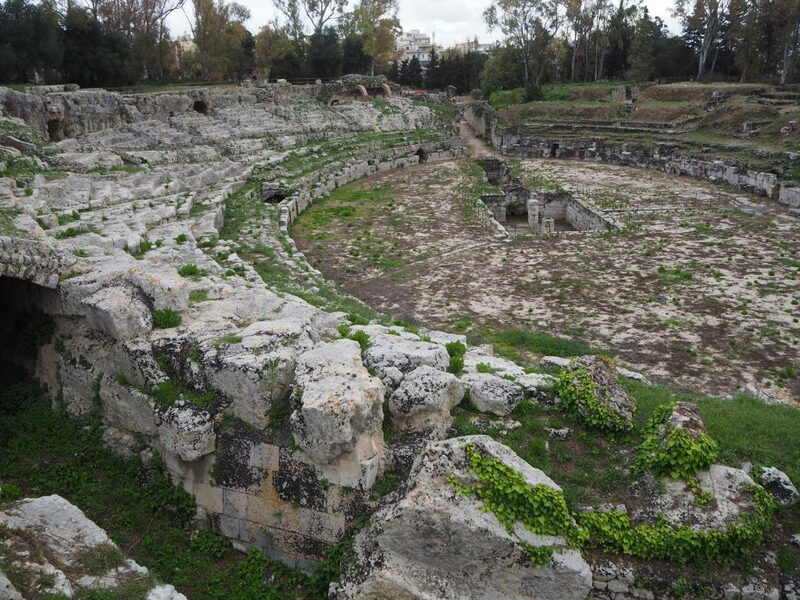 The Neapolis Archaeological Park of Siracusa contains both Greek and Roman architecture lying side by side. Although we are no history buffs we found the site fascinating and beautiful in equal measures. It is a shame there is not more information freely available throughout the park. If you like to know what you’re looking at then I recommend doing a bit of reading before hand, or paying for the information available at the ticket office. As we’re on a budget we used trusty google to guide us around! The thirty minute walk from Ortygia isn’t the most beautiful, but you will pass a few of Syracuse’s sights on the way, so it may be worth combining. It’s also the most ecological of all the options, and the best for you, so there’s that! The quickest way to get there from Ortygia is by car, just a five minute drive and there is plenty of parking along the road beside the archaeological park at just a few euros. There is a bus from Molo Sant’Antonio, on the west side of the main bridge into Ortygia that will take around 15 minutes and cost 1 euro per person. The Greek theatre is on the right hand side of the path as you pass the ticket office, and is arguable the most impressive part of the archaeological park. 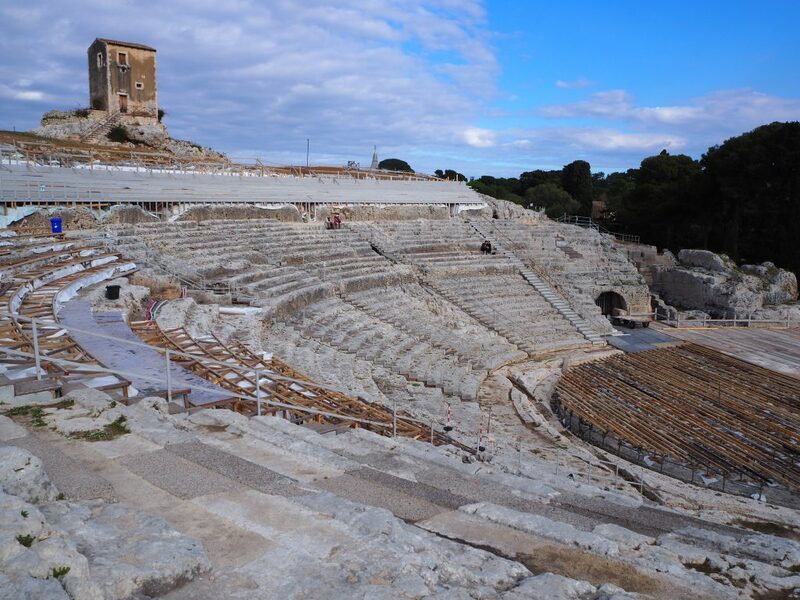 The Greek theatre has been preserved to a high standard and as you approach you will be greeted with gleaming white stone steps leading down the stage below. Dating back to at least the 5th century BC, the Greek theatre is among the largest ever built. 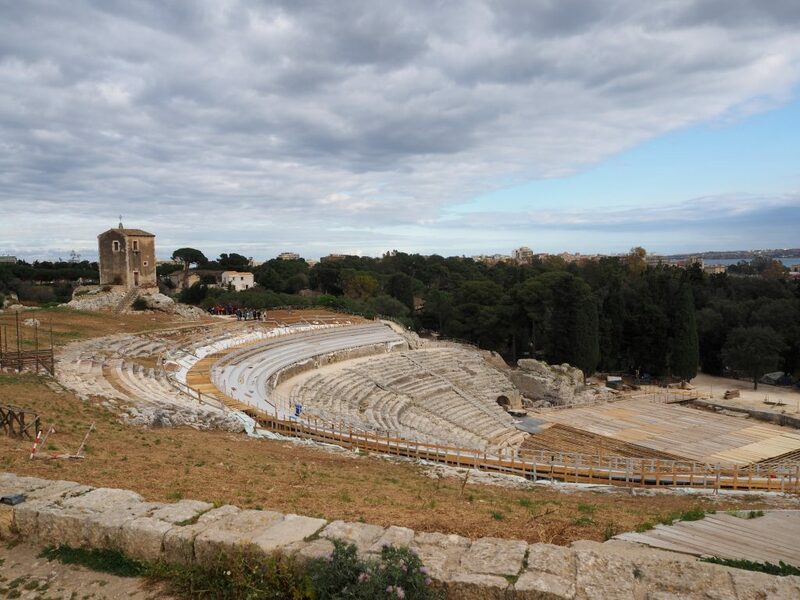 Its 59 rows could accommodate up to 15,000 spectators and has staged the works of Sophocles, Euripides and the last tragedies of Aeschylus, including The Persians, Prometheus Bound and Prometheus Unbound, which were first performed here in his presence. The theatre is still used for performances and there is a festival that runs from late Spring. Be aware: As this is a working theatre there are often building works going on here. Although not the prettiest, it didn’t ruin the experience for us. If you are lucky enough to get tickets to one of the performances here we imagine you would be in for a treat! 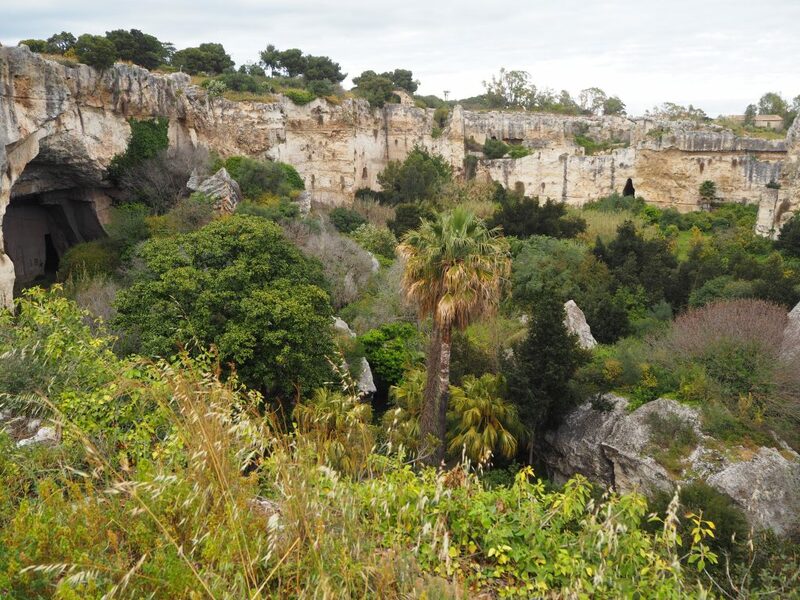 From a path leading down beside the Greek theatre you will find the strange Latomia del Paradiso, a deep limestone quarry that provided stone for the ancient city and later became a prison for 7000 survivors of the war between Syracuse and Athens in 413BC. It is riddled with catacombs (most of which you are unable to enter) and filled with citrus and magnolia trees. It is here that you will find relief from the heat of the sun, and this area, although small, makes a pretty place to rest your feet for a while before exploring the Roman amphitheatre. The Orecchio di Dionisio is an unusual site and one that is not to be missed. 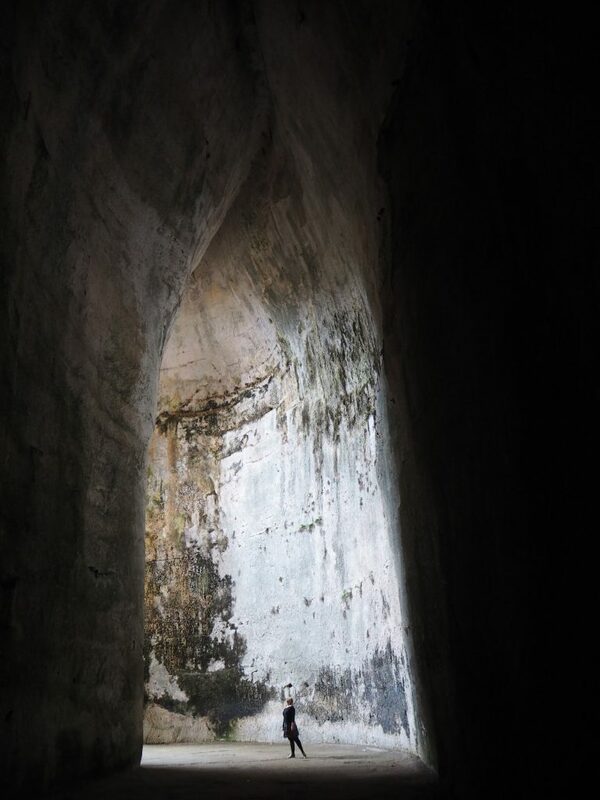 This 23m-high cave extends 65m back into the cliff and was named by Caravaggio after the tyrant Dionysius, who is said to have used the acoustics of the quarry to listen in on his prisoners whispered secrets. We can see how this would be possible, as even a whisper at the back of this grotto is amplified to enormous levels due to the ear like shape of the cave! Kids and adults alike will have endless amounts of fun whispering messages to each other and singing at the top of their voices. On the right hand side you will find the entrance to the 2nd-century Roman amphitheatre. Sadly much of it was destroyed by The Spaniards in the 16th century when they used the stones to build Ortygia’s city walls. It is large, measuring 140 meters by 119 meters and had a much more gory purpose than the civilised Greek plays. The Roman’s used the amphitheatre for gladiator fights with wild animals and horse races. In the centre of the arena is a rectangular room that is supplied by two canals. This area was possibly used to collect the blood and gore from the gruesome contests that took place. West of the amphitheatre is the 3rd-century-BC Ara di Gerone II. This is a monolithic sacrificial altar, where up to 450 oxen could be killed at one time. For a more detailed historical account of the site visit the parks own website here (and make sure google translate is switched on if you don’t speak Italian!) We used this information to guide us around the site and found it just as good as any tour guide or audio guide! 10 euros per adult, with discounts for children, students and Italian teachers. Tip: Keep hold of your ticket for the entire trip. You will end up needing it on more than one occasion! We thought this was a little steep, considering that you will pay the same for a ticket to Sicily’s more famous (and much, much bigger!) Valley of the Temples. If we had to pick only one we would have visited Valley of the Temples, but if budget allows then we think Syracuse’s archaeological park is definitely worth a visit too. There is a small (expensive) cafe and toilets on the Roman side of Syracuse’s archaeological park. This is on the left hand side as you walk past the ticket office. There are also toilets on the Greek side that are a little less obvious. Turn to the left as you enter and you should spot signs. The archaeological park is well set up for wheelchair access, though some of the paths weren’t open when we were there at a quieter time of year. They were clearly signposted so we assume they open the paths as necessary. Water and suncream/hat. There is very little protection from the sun when visiting Syracuse’s archaeological park so keep that in mind if you’re planning on spending any long amounts of time there. There are plenty of photo opportunities so don’t forget your camera! We had a lovely few hours here visiting Syracuse’s archaeological park and could have happily spent another hour or so exploring and taking in the sights. If you are in the area then we would thoroughly recommend a visit. It was one of our favourite sights in Syracuse, and very educational too!